Aerofuels International provides jet fuel uplifts at more than 800 airports around the world under direct contracts with major international oil companies — Shell Aviation, ExxonMobil, British Petroleum, TotalFinaElf, ChevronTexaco, Agip Petroli, Hanwha, LukOil, Kuwait Petroleum, StatOil and others. 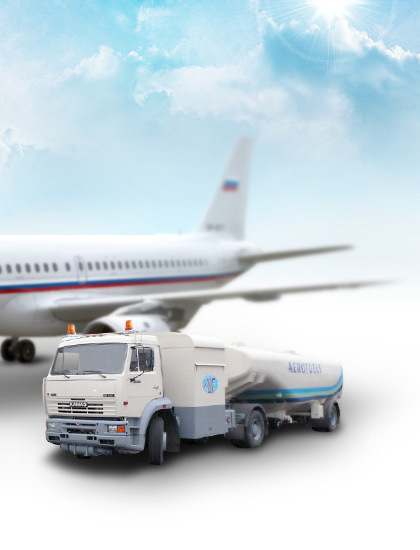 The clients can enjoy the convenience of settling accounts with Aerofuels back in Moscow. In order to choose the most competitive supplier at each airport, get the best purchasing prices for aviation fuel, the company's experts use unique know-how to comprehensively analyze prices in the interna-tional market of fuels, oils and lubricants, taking into account even insignificant market trends and seasonal fluctuations. Consolidation of fuelling volumes of several airlines at each particular airport enables Aerofuels International to offer considerable discounts for its customers. As a result Russian air companies can get fuel uplifts at the lowest possible prices. Our clients are offered very favorable terms, even if they make just a single charter flight. Thus an airline, which needs 10 to 15 tons of fuel at a for-eign airport, gets a discounted price from Aerofuels International, which is elsewhere available for airlines with yearly fuel consumption of 5,000 tons. Many airlines believe they can get better rates if pay cash at the airport. However, in this case they are subject to the so-called Posted Airfield Price (P.A.P. ), i.e. non-contract price used for single refu-eling. It may vary between US$300 and 600 per ton depending on the region. Of course, airlines regularly flying to the same for-eign airports twice or three times a week can conclude contracts with local refueling companies or their agents, and secure better prices than the non-contractual ones. But modest amount of refueling -100 to 200 tons a month — will not permit them to enjoy really low prices offered by Aerofuels International. Moreover, some agents of refueling companies operating at air-ports avail themselves of airlines' lack of information on real local market prices for fuels, oils and lubricants and quote higher prices for Russian air carriers. So making contracts with local agents can also result in losses rather than gains. Currently we work with more than 80 carriers from Russia, CIS and other countries. Among our clients are Russian regional aviation enterprises Utair, Bashkirian Airlines, Perm State Air Enterprise, Daghestan Airlines, Aeroflot-Don, Kogalymavia and Ural Airlines, as well as major passenger and freight airlines East-Line, Atlant-Soyuz, Il-Avia, to name just a few. Many air carriers have realized that cooperation with Aerofuels International helps them to considerably reduce expenses for fuels, oils and lubricants, which is a major factor of financial viability. Another attractive feature of our company is very simple system of financial settlements with aviation enterprises. In April 1996, Aerofuels International signed an agreement with the Transport Clearing House on mutual settlements for aviation fuel supplies at foreign airports through this House. Once or twice each month Aerofuels International draws money due to it for refu-eling abroad from the airline's account at the Clearing House. This makes it possible for Aerofuels International to extend credits for its clients for refuel-ing at foreign airports for three to four weeks. With the introduction of this system of payments, our clients not only can buy fuel at more than 800 airports around the world for competitive prices, but also get options of settling accounts by banking transfers, in Russian currency as well, thereby minimizing their cash and foreign currency spending. To register such settlements with Aerofuels International, accountant's office of an aviation enterprise needs only one table to make. Currently, more than 15 airlines use this system, though payments made immediately after refueling and advance payments are widely used too. And last but not least, our clients do not just purchase JET A-l aviation kerosene at the lowest prices — they also get benefits of excellent and prompt service.